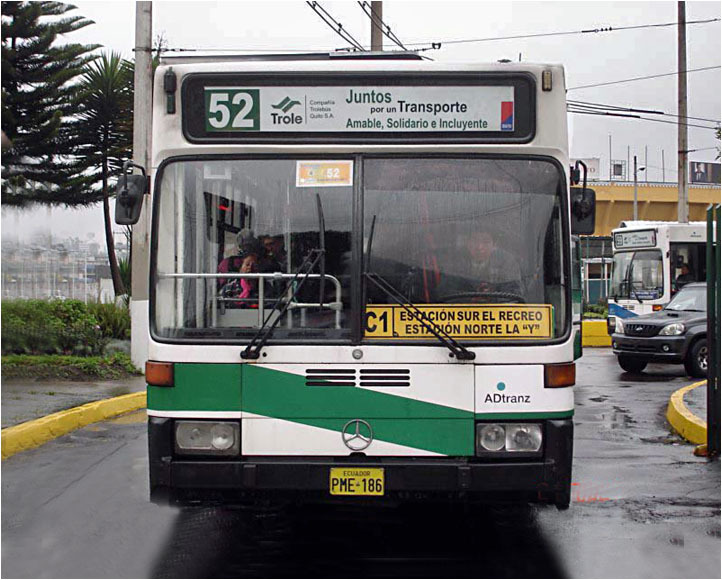 In order to accommodate the longer vehicles, all the paradas were rebuilt. 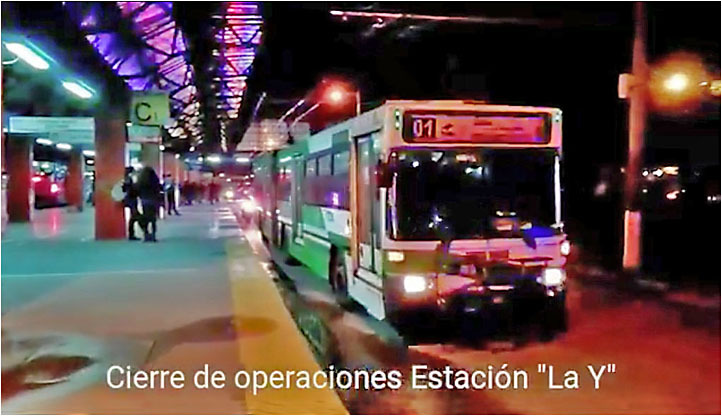 But the new platform doors and levels did not match well and passengers complained of gaps. 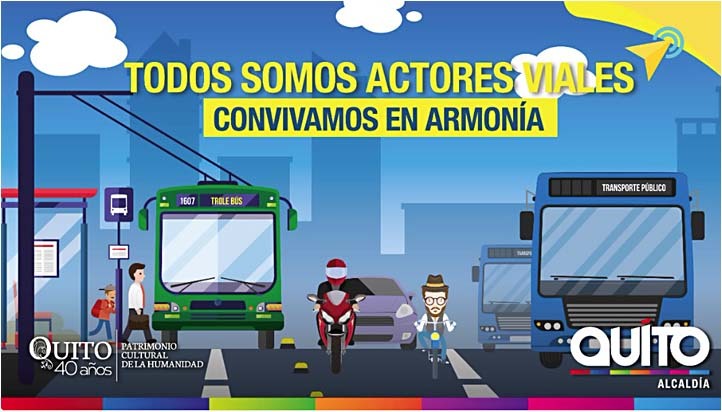 The city responded with this poster: "We're all transport actors. 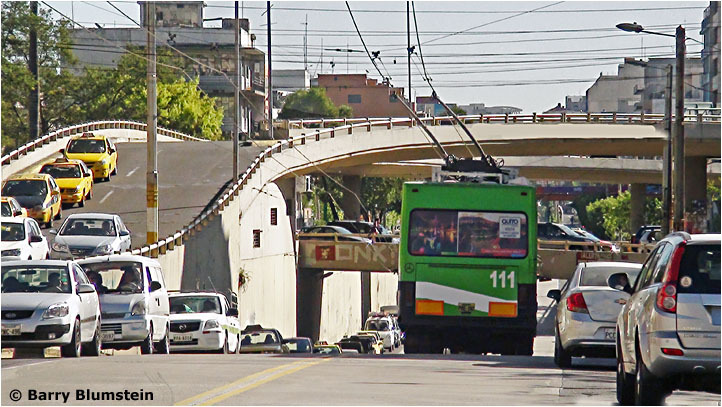 Let us live together in harmony." 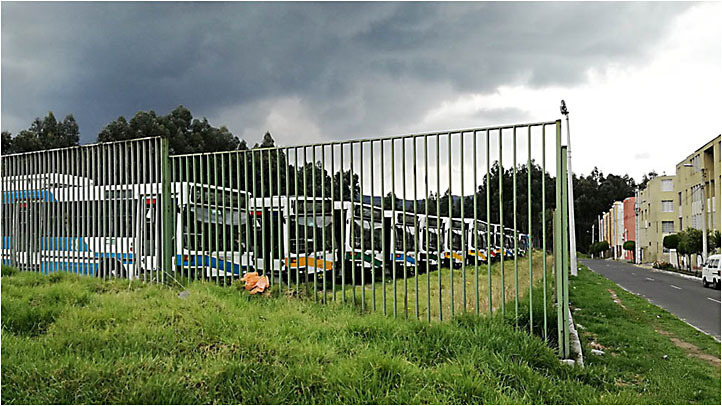 Is it referring to the passengers or the vehicles? 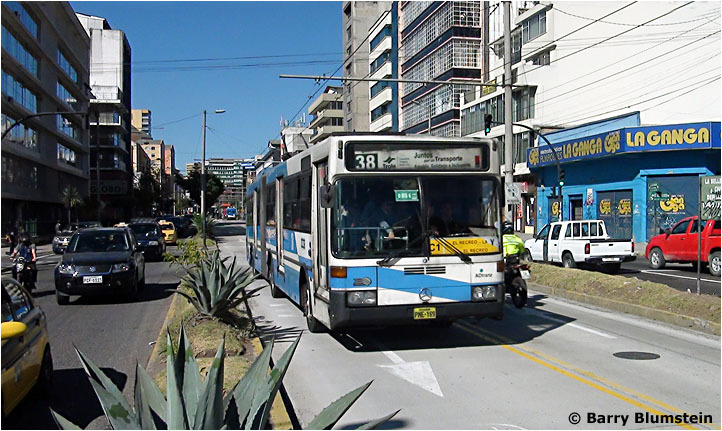 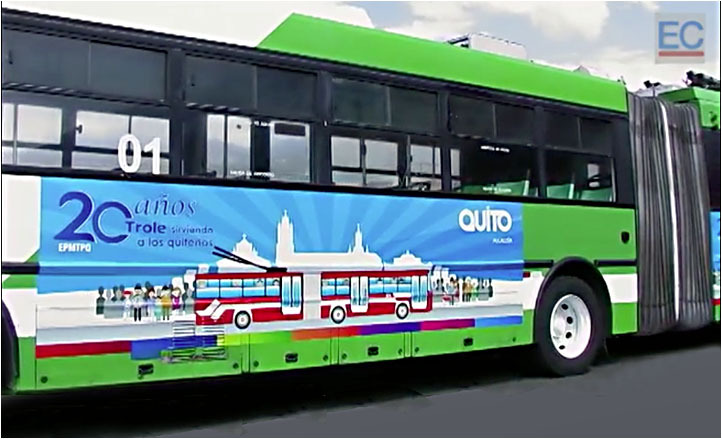 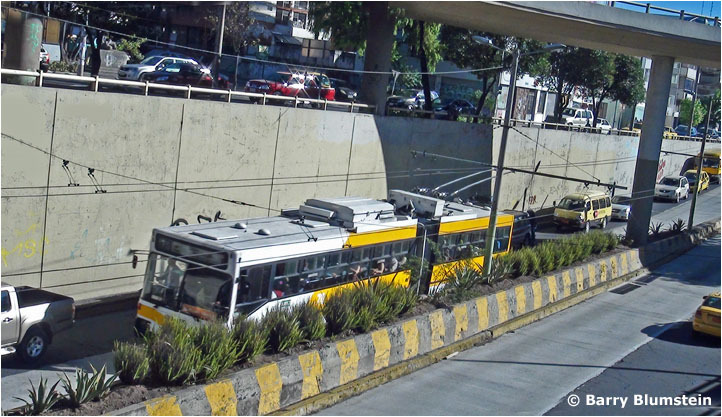 Quito trolleybuses are painted either dark blue, yellow, dark green, light green, light blue or red. 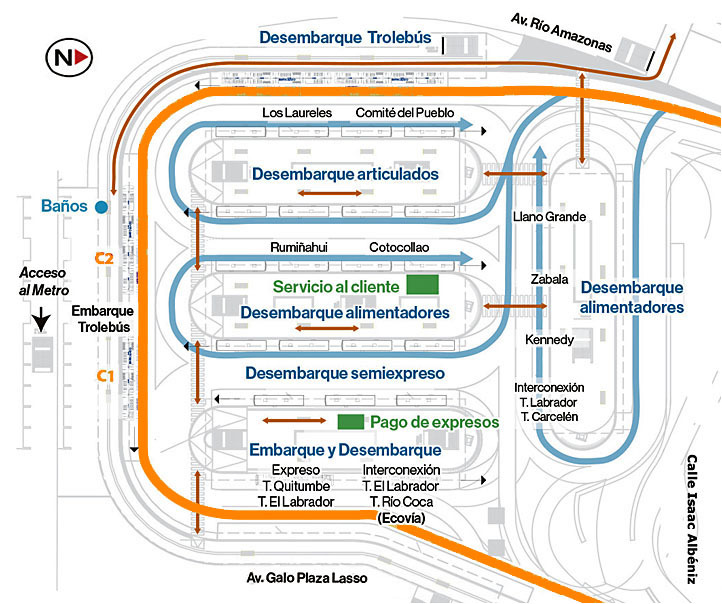 All liveries are shown om this page! 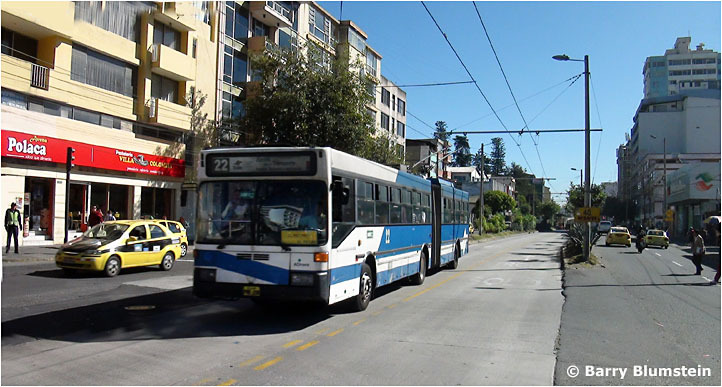 Had Mr. Blumstein had time to explore further, he would have discovered several interesting developments. 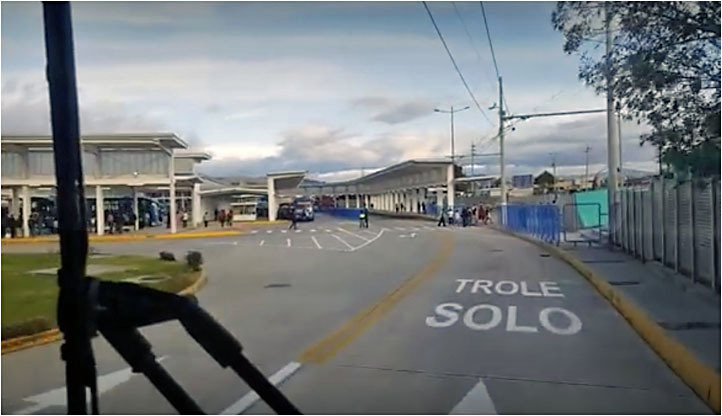 On 27 May 2016, three months before his visit, the Empresa de Pasajeros de Quito de-electrified the entire 7.5 km southern end of the trolleybus line – all operation south of Estación Sur [see map]. 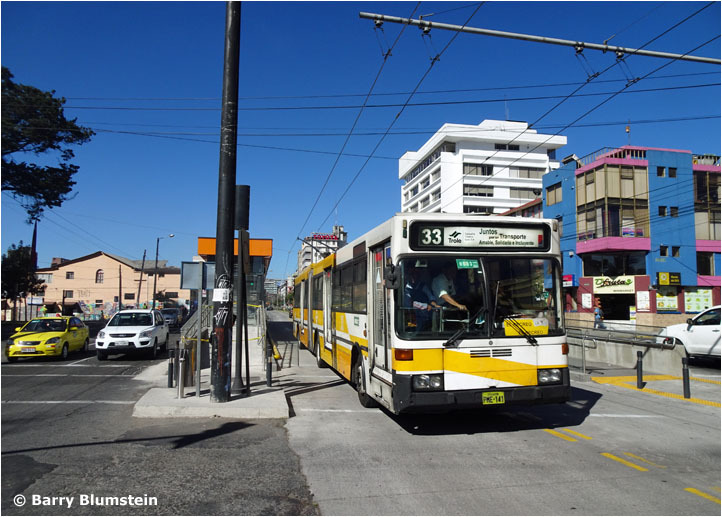 The change was made to eliminate the treacherous left-hand operation against traffic between Estación Sur and Morán Valverde [see Part 3]. 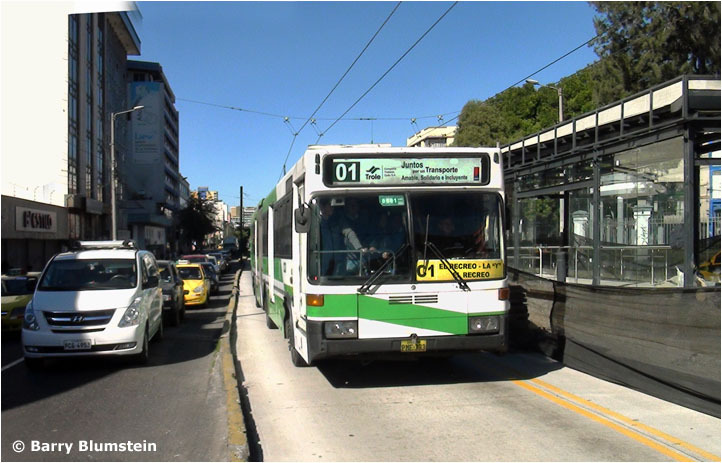 The new diesel buses that shared "El Trolebús" had doors on both sides, so were not affected. 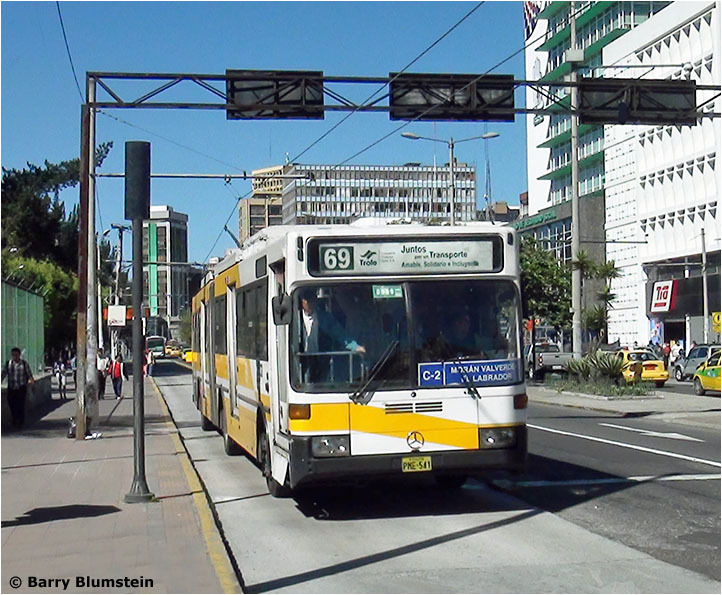 But after that date trolleybuses could no longer go to Terminal Quitumbe. 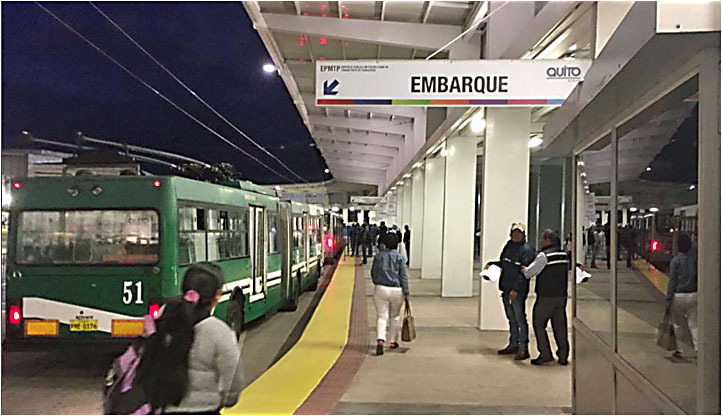 Metro de Quito hopes to begin operation of its 22 km rail line, from El Labrador to Quitumbe, in mid-2019. 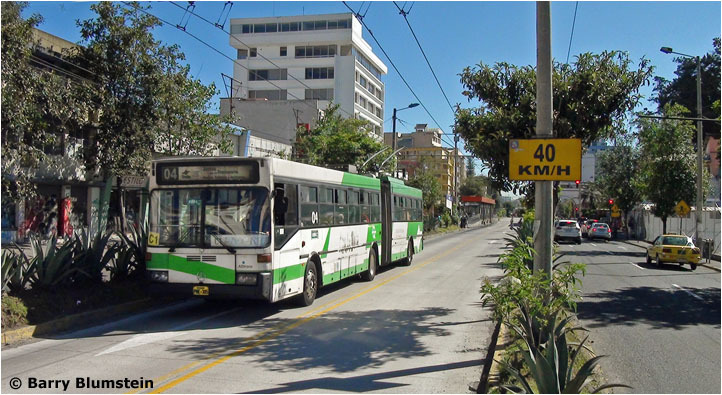 That's 2 km longer than the length of "El Trolebús" between the same places, but the latter is more direct [see map]. 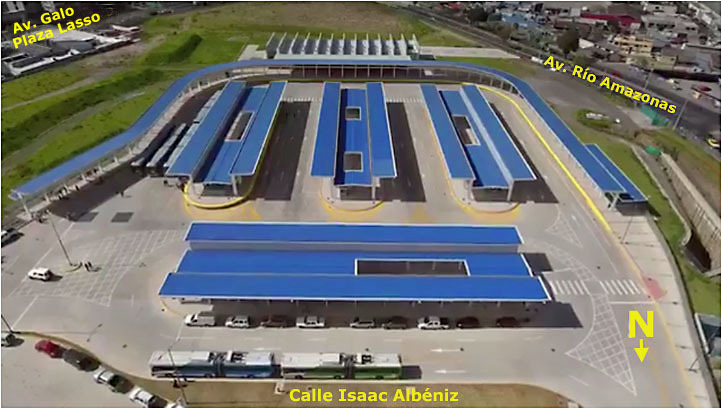 Eighteen 6-car trains will serve 15 stations. 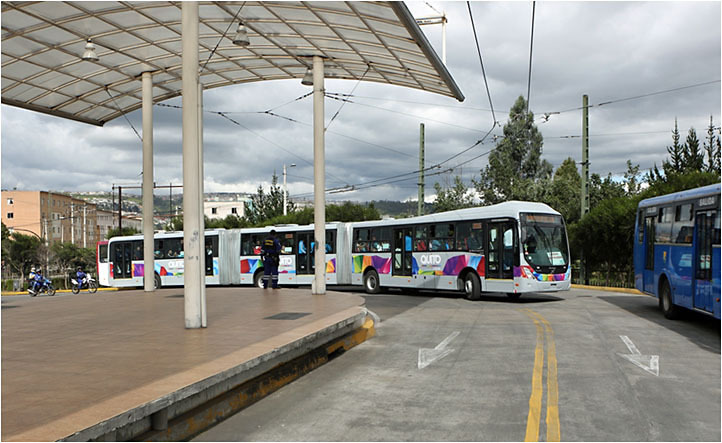 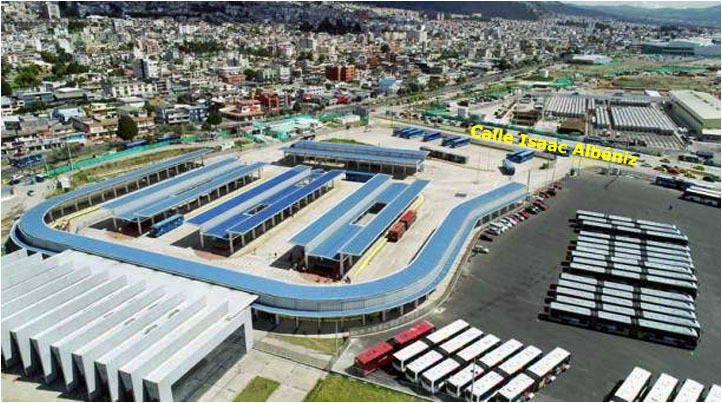 Except at stations there is not much evidence today of metro construction in Quito, since the entire route is underground and was built by a tuneladora. 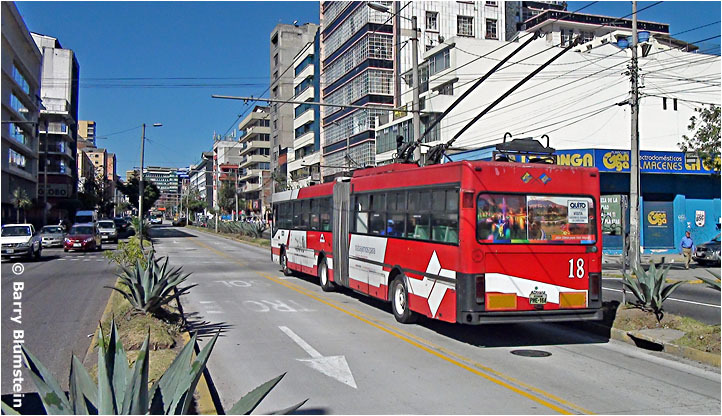 "Quito Informa" Mayor's homepage with information on various topics, including transportation. 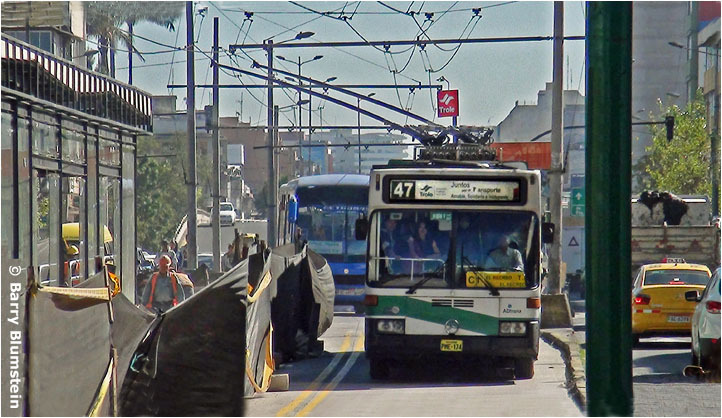 "Transporte de Pasajeros" Instagram page has many photographs, some also seen on the Twitter page below. 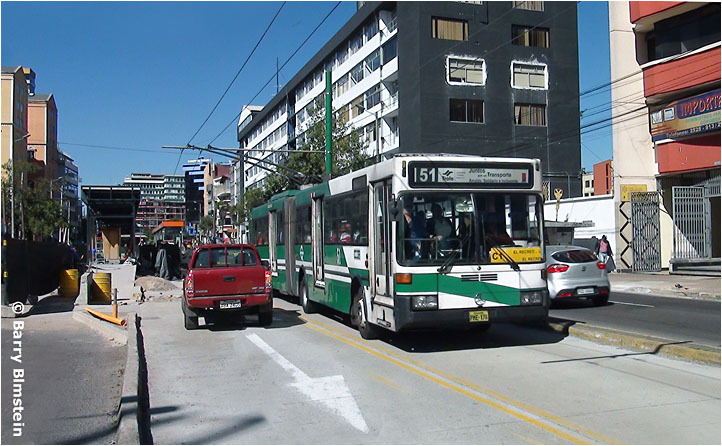 "Transporte de Pasajeros" Twitter page that was a major source of information and photographs on this website. 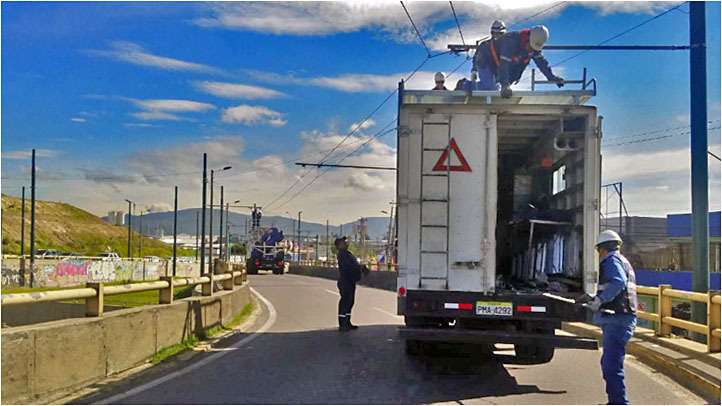 In addition to the items cited above, the author wishes to thank John Kirchner, César Arias, Steve Morgan, Ricardo Yanes, Humberto Gilmer and – of course, especially – Barry Blumstein for their contributions and assistance in the preparation of this page.